Sorry, but I am combining two days' blogs again. I didn't journal last night because the mosquitoes were ferocious and they chased me into my hammock as soon as I finished my chores and ate my dinner. Yesterday was a really nice day. I felt strong and ate up the miles. Sunfish Pond was beautiful in the morning mist. I saw a half dozen deer at various points during the morning, as well as rabbits and frogs and a raccoon. I caught up to the crowd that includes Squeegie and The Twins and Half Moon and Sunbeam at lunch time. I also met two section hikers named Howdy and Minnow. Oh, and D.O.C. was there. D.O.C. is a very cool young guy of 19, who is a bit of an accidental thru-hiker. He started out planning to hike from Fontana Dam to his home in Daleville, VA, but was enjoying it so much he just kept going. A while after lunch I ran into D.O.C. and Howdy and Minnow again, and they were going to take a half mile side trail to a swimming pond, and I decided to go with them. It was a nice sunny afternoon and the water felt wonderful. By the time I got to the shelter my feet were pretty sore, and the mosquitoes were absolutely awful, but the day as a whole was wonderful. Today, on the other hand, was a pretty miserable day. It rained early this morning and it stayed hot and very muggy all day. The mosquitoes have been awful. So far on my hike I have fallen twice, both on the morning I walked into Pearisburg. Today, I took falls numbers 3, 4, and 5. Wet boots on wet rocks can be like ice. On one fall I landed on my wrist, and it is pretty sore. I don't think I did anything really bad. It isn't swollen or discolored, and I have full range of motion. But it feels very tender when I lean heavily into my hiking poles, which I do when going downhill. So, I need to stop this and make my dinner, as it is 6:30. More tomorrow. Goodnight from NJ. Every time I woke up last night I could hear the swarm of mosquitoes buzzing on the other side of the netting on my hammock. It was a bit unnerving, actually. It was still very damp when I got up this morning, and I ate and packed hurriedly so I could get moving and try to escape the mosquitoes. Are you starting to see that tiny little insects are now in control of my life? After the three falls I took yesterday, I was leery of all the wet rocks this morning and I moved more slowly and carefully than usual. When I got to High Point State Park I stopped at the tower just south of the High Point Monument; not for the view, as there wasn't anything to see but fog, but rather because it was windy up on top of the tower and I could sit and eat without the 'squitoes bothering me. The AT does not go over High Point, but I took the few minutes necessary to drop my pack and scamper up to the highest point in New Jersey, and then back down. After leaving the park the trail goes through some lowlands where it threads it's way through some nearly suburban neighborhoods. There was lots and lots (and lots and lots) of mud through here, but the air was freshening and felt drier and cooler, and the sun was starting to break through more and more. At one point I was actually in New York State, but only briefly before crossing back into New Jersey. Then the trail makes a loop through the Wallkill River (isn't Wallkill River a redundancy?) NWR. The sun was out now and at one point I came upon a large, expansive bench next to what I assume is a wildlife viewing blind, and I stopped here and spread all my wet stuff out. I ate my lunch and was just settling down with my book when I heard the rumble of thunder in the distance. I just had time to get my gear stowed away when the sky opened up and it poured on me. So much for trying to dry my boots! It was only a couple miles from the wildlife refuge to this shelter, and by the time I got here the sun was out again. The only problem I had is that I didn't read the book ahead of time, and thus did not know that the water supply for the shelter was at the bottom of Pochuk Mountain, 1/2 mile BEFORE I got to the shelter. When I got here and couldn't figure out where the water is, I reaqd the book then realized I had to walk a half mile back down the mountain, then of course climb the half mile back to the shelter. Duh! I hung my hammock and strung my bear bag line as a clothesline, then out out all my wet stuff, and even my sleeping bag and the little down jacket I use as a pillow. They sure could use some fresh air and sunshine. 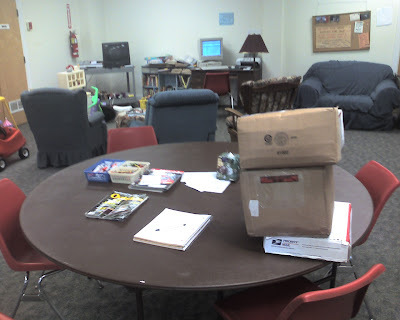 It clouded up again a little while ago and I put everything away. I think we might get another storm this evening, but it is definitely cooler than last night, and the forecast for the weekend is dry. I have to go into Vernon, NJ tomorrow to resupply. I still haven't decided if I am going to stay in town or come back out onto the trail. If I stay in town tomorrow night then I will reach New York on Sunday. If I gho in and out of town tomorrow then I will sleep in New York tomorrow night. tent so it was actually partially under my hammock tarp! road is brutal on the feet, and my feet already hurt badly enough. finally he dropped me just across the street from the church. the driver again, then close the door. Just a little bit of insurance. the next week, and it looks about as good as one could possibly hope. is a diner of some kind open around the corner. Maybe I'll try that. other hikers coming, as that could mess up those plans! watch it on TV, but apparently they don't get Versus here. Darn! water. That water seems to have destroyed the display on the camera. the TV on too, or is that mostly a guy thing? of food to choose from! If I could only eat it all. My apologies yet again for combining days. The last couple of days have ended with me just exhausted. I am not sure why. I'm not doing huge miles that I've never done before or anything like that. Maybe I am just getting worn out and need a few days off. We'll see. Anyway, I left New Jersey and crossed into New York yesterday. Soon afterwards I was atop the ledges of Prospect Rock eating my lunch while looking down on all the boats on Greenwood Lake, with the Manhattan skyline just visible in the far distance. That was pretty darned cool! Whoever laid out the trail in New York really likes scrambling around on huge rock ledges, and goes out of the way to route the trail over every chunk of rock to be found. It's fun for a while, but it gets old fast. I don't even want to think what it would have been like if it were raining! Yesterday was Jodi and my 3rd anniversary! On our anniversary last year we were cycling from Boston to DC. This year Jodi was out in Denver visiting friends and I was hiking the AT in New York. Gosh, I miss Jodi! The single biggest negative about hiking the trail is being separated for so much time. Today was more up and down hiking. We haven't had to do so much up and down since probably way back in southern Virginia, and it makes a huge difference in how tired my legs feel at the end of the day. Right now I am less than 10 trail miles from the Hudson River, which I will cross tomorrow. That seems like a huge milestone to me. 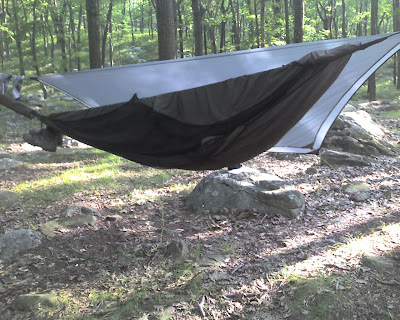 Tomorrow night I plan to camp at the Graymoor Monastery, just outside of Peekskill, NY. The monastery provides camping, a covered pavilion, water, privy, and shower for hikers, all free of charge. In the past they even invited hikers in for dinner with them, but they no longer do that. Since there is a 31 mile gap with no trail shelters, the monastery's generosity solves a huge logistical problem for hikers. Early this morning I had to cross the Palisades Parkway during morning rush hour. This was like a game of live-action Frogger, only without the reset button. At the time I thought that was going to be the highlight -- or lowlight -- of the day. A few hours later I made it to the summit of Bear Mountain. A motorcyclist asked me if I had hiked all the way from the bottom. I said "I hiked all the way from Georgia." This lead to a conversation which I really enjoyed. He is a just retired cop from New Jersey and we talked about his many cross-country motorcycle trips and his plans to ride to Alaska. We also talked about hiking and bicycle touring. When it came time to leave he told me he was also a pastor -- which I had figured since he had a well-thumbed bible sitting next to him as we talked -- and he asked if he could pray for me, which I happily agreed to. Many of you know I am not at all religious, but it always touches me when people who believe in God's power are moved to try to share that power with me. After leaving the summit of Bear Mountain I made my way down to the bottom where the AT goes through the Bear Mountain Zoo. This is a sad little zoo with desultory animals stuck in tiny little cages. I took no pictures as it was nothing to celebrate. 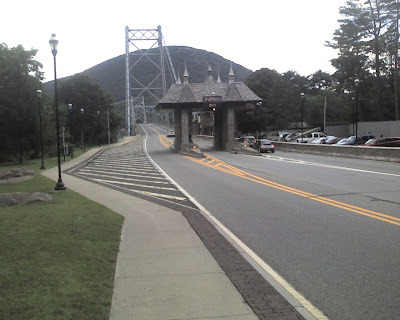 After the zoo, I crossed the Hudson River on the Bear Mountain Bridge. This seems like a huge milestone to me. It was fun walking across the bridge and being able to look up and down the river at my leisure. The Hudson is a huge river here, but I remember hiking in the Adirondaks and stepping across the highest head-water of the Hudson, which is a little brook draining a swampy area just below the summit of Mount Marcy. As I was crossing the Hudson I noticed storm clouds building in from the west, and once I was on the east side of the river I had to stop and put the rain cover on my pack as a few raindrops were falling. Soon I was back in the woods and climbing the side of a mountain, when I heard thunder to the west. A few minutes later it sounded like a freight train was coming through the woods behind me, and I was hit by a wall of wind. The trees bent over, all the leaves turned inside out, and leaves and bits of branches -- most small but a few rather big -- were flying through the air and hitting me. I wasn't sure what to do so I found the fattest, sturdiest looking tree I could and stood in its lee. My thinking was that the tree would hopefully stop any large branches from hitting me directly. Well, it was all over in ten minutes or so, but it felt like an eternity while it was going on. When I heard sirens going off in the valley below it only added to my anxiety. Once the worst was over I felt an incredible elation. Living removed from the comforts of home sometimes subjects you to discomfort, but it also exposes you to euphoric moments. I have been smiling all afternoon since. So right now I am sitting in the pavilion at the ball field of the Graymoor Monastery. There is a shower, though it is cold, a sink with running water, electricity, picnic tables, and a porta-john across the field. 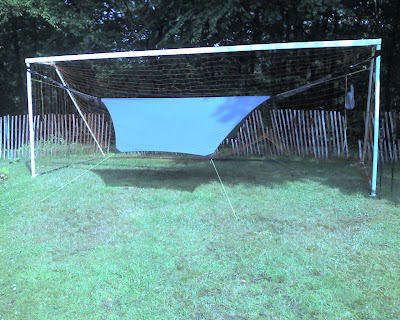 Since it is a ball field I wasn't sure how I was going to set up my hammock, but I solved that dilemma by setting it up between the steel uprights of the soccer goal. It turned out to be the perfect size for my hammock. So, I will be coming through Connecticut this weekend. If all goes according to plan I will be at Telephone Pioneer Shelter on Thursday night. That is just 10 miles short of the CT border at Hoyt Road. If I go full speed through CT, I would be at Mt Algo on Friday night, Pine Swamp on Saturday night, and up on the Riga Plateau on Sunday night. I need to go into either Kent or Salisbury on Saturday or Sunday to resupply. But there is no reason why I need to go through CT full tilt. If anybody wants to come out and see me, or even hike with me, I would be thrilled to take it easy and do a couple of short days. I could stop at Ten Mile River on Friday, and do a couple of short days. That would still get me to Kent in time to resupply. So, if anybody has any inclination in this direction, please let me know and we can work out where / when to meet up. My hammock set up in the soccer goal at the ball field of Graymoor Friary. all I wrote previously about CT still holds, except that I will be leaving sometime on Sunday to go to NYC with Jodi. Because of a change in her work schedule, the NYC trip had to move from Tuesday to Sunday. There really isn't a whole lot to say about today. It was a nice enough day, but I just walked through the woods for 9 hours. There was one view where the trail climbed to a ridge overlooking Canopus Lake, and that was it. There was at least one more thunder storm last night, and everything was wet when I got up this morning. The sky has been partly cloudy all day, but it hasn't rained. Since the woods are wet there are plenty of mosquitoes out and about, doing their mosquitoey best to make me lose my temper. Sometimes they succeed. I am trying to get my family together for lunch in Kent on Sunday. I don't know yet if that will come to pass or not, as I haven't heard back from my brothers yet. It is all last minute, as it was impossible to be certain when I would reach Connecticut until the last day or so. But, assuming we meet in Kent on Sunday, that means I will have a very easy schedule until then. From Telephone Pioneer Shelter I will hike to Ten Mile River on Friday. That is only 12.7 miles. Hopefully the weather will cooperate and I can enjoy myself kicking back at Ten Mile River. Then on Saturday I will hike the very short 8.4 miles to Mt Algo Shelter, which is just outside of Kent. Then on Sunday I have the entire morning to walk the 1 mile from the shelter into town. Jodi will meet me in Kent, and after lunch we will be off to New York City to live the high life for a few days. This afternoon I soaked my feet in Nuclear Lake. Tonight I will check to see if they glow in the dark. Another day of nothing special. There were a couple of local views early this morning, then I mostly just walked through the woods all day. I did take a side-trip down the road when the trail crossed NY52 this morning, to get myself a quart of OJ, a toasted bagel with cream cheese, and some other junk food from a deli. And a bit after lunch time I came upon a group of about 30 girls out for a day hike with one or two adult "leaders" who had absolutely no idea where they were. I took a few minutes to show the leader where they were on the map, but even after asking her several times where they were trying to go, all I got was that they were headed to some lake. Exactly what lake, I never learned. It's rather scary to think that someone in charge of such a big group of kids would be out in the woods with apparently no clue as to what she is doing. I met a father and son team of southbounders a bit later, and I asked them to be as helpful as possible if they were asked for information. I was thinking maybe the woman leading the group was uncertain if she could trust the info I gave her, but if it were reinforced by someone else she might be more inclined to believe it. I had plans to meet a GMC friend here tonight, and I was greatly looking forward to that, but he had to cancel at the last minute. The weather has been quite strange. The wind is out of the northeast, which around here usually spells trouble, and it is quite chilly. It certainly doesn't feel like July. Also, I have noticed that whenever it gets the least bit chilly I feel the cold very quickly. That probably has to do with how skinny I've become. I feel a bit foolish wearing my down sweather in July, but I do it anyway. I will be meeting another GMC friend tomorrow afternoon at Ten Mile River. I used to take my daughter Anju camping there quite often when she was little, so the place has many pleasant associations for me. Anybody know why Nuclear Lake is called Nuclear Lake? Maybe somebody could do a bit of googling and find out for me, as I am quite curious. I sort of remember reading about it many years ago, but I can't remember any of the details. my bear line as a clothesline and hung everything out to dry. is 8 miles or 18 miles, the last mile always seems to take forever. woods. They stopped and stared at me and I did the same in return. MD3, OG, Joker, FlyBy, and a bunch of others. boyfriend Drew, my ex-wife June, and Anju's godfather Henry. New York City, where we are spending a few days living the high life. could buy a lot of gorp or Ben & Jerry's ice cream. Jodi and I are having a wonderful time living in the lap of luxury.